It's slimmer than the UltraHD, but is it worth an extra £20? As functional as the Flip pocket camcorders are, cheap they are not. At £179.99, the new Flip MinoHD is £20 more expensive than its sibling, the Flip UltraHD, but is it really worth the extra cash? In terms of the videos they produce, there's no discernable difference between the two. Both record 720p HD video at a resolution of 1280 x 720, both record at a frame rate of 50 frames per second, and both now include digital image stabilisation for smoothing over those inevitable hand wobbles. 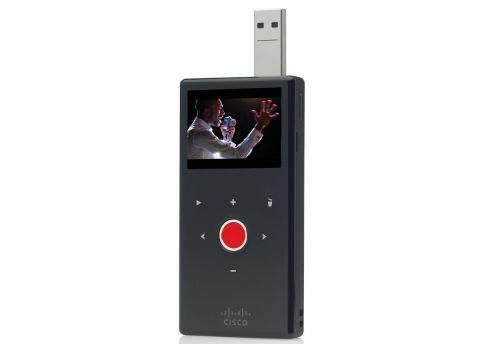 Furthermore, both have up to 8GB of storage, enough for two hours of footage, both have the flip-out USB connection, a tripod mount, a proprietary HDMI connection (cable costs extra) and built-in software that helps you upload direct to your social network of choice. The only real difference between the two Flips are their relative appearances, despite them having the same two-inch 320 x 240 LCD display. The MinoHD might be described by some as the UltraHD's younger, sexier sister (although, with self-erecting USB dongles on both devices, should we be referring to them as male?). It's slimmer than the UltraHD – always a good start. It's also smaller, and it weighs less. The MinoHD also has touch-buttons on the front instead of the more orthodox plastic appendages on the front of the Ultra. But while these are all positive things in theory, in practice we fail to see the real-world benefits of all those on-paper positives. For a start, those touch buttons can be really irritating. Every time one of our digits accidentally brushed across one of them, the device registered a key press. Luckily, the red 'record' button is a proper button, so we didn't start or stop recording by mistake. But we did accidentally zoom during recording, we did almost delete one of our videos by mistake, and we did unintentionally start playing back some of our videos. We honestly prefer the (albeit uglier) plastic buttons on the UltraHD. As we found with the Flip UltraHD, video quality on the new Flip MinoHD is surprisingly good. The 50fps frame rate means that when panning or filming fast-moving objects, the video stays as smooth as can reasonably be expected. And with the addition of image stabilisation (even in its weakened digital form), it's now possible to record shots without that annoying hand-shake distortion. The MinoHD is a decent little camcorder, but it comes at a price. It's too expensive in our book, and just isn't worth the extra cash over its big sister, or even some of the other HD handhelds out there that cost a lot less (stand up the Creative Vado HD). Sure it does look good, we'll give it that – we certainly wouldn't climb over the MinoHD to get to the UltraHD, and the video quality is great, but we still don't think that's enough to warrant the extra £20 on top of an already high asking price.